Home » Connectivity » Nook vs Kindle: How do These eReaders Stack Up? Nook vs Kindle: How do These eReaders Stack Up? The Nook (created by Barnes & Noble) and Amazon’s Kindle are some of the most popular eReaders (also written as “e-reader”) on the market today. They allow you to take your entire library with you to read wherever you go (and some allow you to surf the web and more)! What features should you take into consideration? We’ve created a pricing and features comparison table with all of the Nooks and Kindles included. Then we go over each category in detail and what you should consider when making your buying decision. Below is a table showing the different Kindles and Nooks available along with some of their features. We will go into detail about what you want to look for in your eReader, but first be sure to take a look at this table. Screen Size 6" 6" 6" 6" 6" 6" 8" 9.6" 7"
Dimensions 6.7" x 4.7" x 0.40" 6.7" x 4.7" x 0.40" 6.7" x 4.6" x 0.36" 6.4" x 4.5" x 0.30" 5.6" x 4.8" x 0.13-0.33" 6.4" x 4.7" x 0.34" 7.81" x 5.31" x 0.22" 9.52" x 5.89" x 0.38" 7.36" x 4.25" x 0.35"
What Do You Want To Do With Your eReader? Do you want to avoid distractions and only allow yourself to read on the device? We are going to classify this as an eReader. Do you want other options like watching videos, using Microsoft Office and surfing the web? We will classify this as a tablet. Depending on your answer, you’ll probably want one over the other. If you want zero distractions, we suggest you choose a Kindle or Nook GlowLight Plus. If you’re looking for versatility, we suggest you choose a Samsung Galaxy Nook. Still struggling with deciding between an e-reader or a tablet? Maybe this video will help you out! 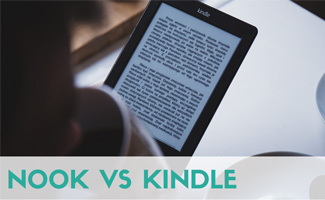 Now that you’ve chosen what you want to do with your eReader, you need to choose between the devices the brand offers. Memory: How Much Shelf Space? How many books can it hold? This question is an important one to take into consideration, especially if you like a big library. You don’t want to be forced to delete your books so you can download more books. What if you want to read them again? The more books it can hold the better! All of the Kindles and Nook GlowLight Plus have 4GB of storage which allows them to hold thousands of books. The other Nooks have larger storage and also allow your to expand your storage. Battery Life: Can It Stay Charged? How often do you want to charge your device? Probably not very often, especially if you take long cross-continental flights. So the longer the battery life the better. Keep in mind that if you are using your e-reader for other things like video, the battery life won’t be as long. The Kindles only allow for you to read (not watch video) so the battery lasts a lot longer on a single charge. Expect up to 6 weeks for the Kindle Paperwhite and Voyage and the new Kindle Oasis lasts up to 8 weeks if you use it to read a half hour per day with wireless off. The Nook GlowLight Plus has a 6-week battery. However, the other Nooks aren’t as long if you use video and other features. Screen Features: What’s Important To You? It may seem obvious but this isn’t always something we take into consideration. The top priority for you should be viewability. Are the pages easy to read where you plan to do the most reading? Which eReader is most like a book? The pages of a book are easy on a reader’s eyes and so should your eReader. If you plan to read outside, glare and brightness are going to be major factors to think about. Do you like reading outside? An e-reader without reflection or glare can make it a whole lot more enjoyable. If you plan on reading on the beach, outside on your porch, at the pool or at a park, this should be a priority for you. Do you plan on reading magazines or comics? These often contain graphics which are typically enjoyed in color. However, black and white is easier on the eyes and better for outdoor reading. You want to be able to hold your eReader in your hands comfortably. While a larger eReader may make you feel like you’re getting more “bang for your buck” you may actually get more frustrated. You want to be able to read comfortably and you can’t do that if you can’t hold the device in a relaxed position for extended periods of reading time. Each of us has different preferences, so if you have a favorite book that feels good to hold, measure it and weigh it. Then see if there’s an eReader that is close to the same specifications. Bottom line is, readers say that the actual books sold for Kindle are cheaper. We aren’t sure why this is, but readers have said there have been many instances where Nook books (sold through Barnes & Noble) have been much higher priced than the Kindle version (sold via Amazon.com). The Samsung Galaxy Nook tablets have email, YouTube and web browsing capabilities. The Samsung Galaxy Nook tablets and all of the Kindle eReaders have parental controls. Kindles allow you to look up words you don’t know. The Samsung Galaxy Nook tablets have cameras and Microsoft Office capabilities. *The waterproof feature is if it is in fresh water for up to 30 minutes at a maximum depth of 1 meter. Nook says you should still avoid immersion in saltwater or other liquids. Kindle vs Nook: Who Is The Winner? If you’re looking for a true eReader, meaning a tablet used for reading only, we have to choose the Kindle over the Nook. Although we like the Nook GlowLight Plus, the fact that Nook books are more expensive than Kindle’s makes us feel like the Kindle is a better option. More specifically, our favorite Kindle e-readers are the Paperwhite, Voyage and Oasis. These three Kindles have a built-in light to assist in darker reading locations, which is why we like them over the Kindle and Kindle for Kids. Looking for something specifically for the kiddos? Make sure you consider these apps which allow you to have parental controls on them. Which eReader are you thinking of getting and why? I adore my Kindle Oasis for reading books. I still have my old Paperwhite in a drawer as a back up, but if it came to it, I would be ordering a new oasis quickly. For magazines and graphic novels, I prefer either my 8 inch tablet or my 12.2 inch Samsung Note. As a web developer I also have a number of reference books the I prefer to purchase in Kindle format and read on the Kindle desktop app. PDF files are a distant second place to that. I’ve been debating between Kindle and Nook but since I already have an Amazon Prime account that makes the decision a little easier to stick with Kindle, just trying to decide which one. The chart is super helpful though, so I think I’ll go with the basic one for now which is only $79 and I can always upgrade later on. That’s only the price of 2-3 books!